The Fargo Force scored five powerplay goals, and blasted past the Lincoln Stars at the Ice Box by a score of 7-3. With the win, the Force are now up 2-0 in their best-of-five game series against the Stars. The Force have now won five straight playoff games, and have yet to lose in postseason action. The Force can wrap up the series Saturday night in Fargo with a win against the visiting Stars, which would earn them a spot in the USHL Finals. Scoring goals for the Stars in Game 2 was David Gerths, and Kirt Hill (2). The Stars outshot the Force for the second straight game, 34-29. Anthony Borelli started in net for the Stars, but was quickly yanked in the first period after giving up 3 goals on 6 shots on net. Kevin Murdock came on in relief, and stopped 19 of 23 shots on net in the loss. This one was another tough one to watch. Lincoln's penalty kill unit was #1 statistically during the entire USHL regular season. It was something the Stars always did well, and were very proud of it. Somehow, it all fell apart in this game as the Force went 5-for-7 on the PP. The anemic Stars PP didn't help matter either, as Lincoln went 0-for-3 with the man advantage. Lincoln is now 1-for-25 on the PP in the playoffs. After missing Game 1, Fargo forward Josh Birkholz exploded against the Stars, scoring two goals (including the game winner) and adding one assist. Andy Taranto continued his hot streak, adding two assists. The Stars simply could not solve the Fargo PP in this game, and had not answer for the team speed of the Force. I have been really surprised at how fast a team the Force are. Countless times I've seen Fargo forwards skate thru, or around Lincoln defensemen. The one game the Stars make Mike Lee look human, their defense and special teams completely fall apart. I thought Lincoln did a much better job at crashing the net, and making Lee work to make saves, but it didn't last the entire game. In the third period, the Stars only managed five shots on goal, and seemed content to ride out the loss. The Stars have not lost three games in a row all season long. We won't have to wait long to see if the Stars have it within themselves to prolong this series, as Game 3 in Fargo is Saturday night. The Stars have proven that they can win on the road, both in the regular season and the playoffs, and have won three games in Fargo already this season. Winning two straight games in Fargo sounds daunting, but it can be done. It's another overused sports cliche, but Lincoln has to play one game at a time at this point in the season. Don't worry about a possible Game 4 or 5, just win today. I still have faith. Go Stars. 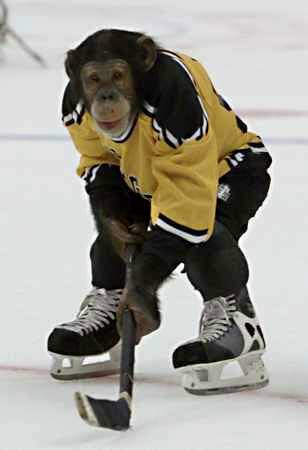 I haven't really had to do this in awhile, but I'm calling up the Hockey Monkey in hopes his hockey monkey mojo can help the Stars win Game 3 and get back on track in this series. It worked before...I sure as hell hope it works again. Yeti, excellent analysis of games 1 & 2. IMO, these games, particularly #2, are the culmination of an overriding weakness apparent throughout the season. Stars coaching is not on a par with the obvious depth of talent of the team. Putting together a team deep in talent is only one part of a coach's job. PP ineffectiveness, short-hand goals against, high percentage of draw failures, numerous critical penalties, & lack of puck control ("using the ice" via passing on defense/offense,cumulatively add up to the Stars playing a pick-up game while the other competitive teams are playing a disciplined game. Look at the performance in these activities of GB, CR, Indiana, and, now, Fargo, compared to the Stars' fits and starts. I say "now, Fargo" to illustrate that, with top flight coaching, it has clearly raised its game. Yeti, I agree with the above poster that the Stars Coaching staff does not have a clue on not only ghow to prepare these players but more importantly develop them as the season goes on.I remember reading a post recently about how many players Lincoln has got from other organizations. If it wasn't for these players we would not even be in the playoffs. The team is physical all year and now we fsll apart on the PK while the power play continues to struggle. Has any other team in the league managed all those crucial "too many men" calls and I don't even want to talk about shorthanded goals.This all comes down to coaching. It will get worse before it gets better with more quality coaches entering the league to "right the ship" in DM and Tri city to name a few.What good does it do to lead the league in penalty minutes when we have to play the game shorthanded? Our power play says it all. The coach doesn't have a clue!